Sister birthday wishes can be, say, funny, heartwarming, clever, cool or joyful — but they should never be ordinary. That's because your sister, whether you like her or not, is unique in every way. Sending an extraordinary birthday message to your sister is the best way to make her special day all the more incredible. 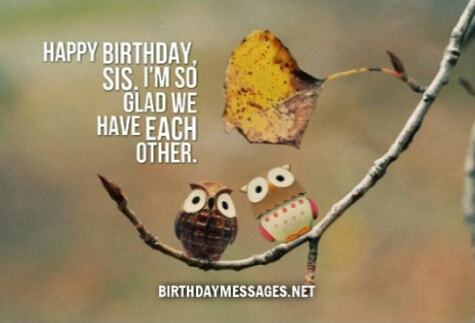 This page has amazing birthday messages for sisters, just for you. Click right here if you need some tips on picking a real winner for your sis. Sis, you are perfect in so many ways. You are special in every sense of the word. You are simply the best. I guess you take after me. Happy birthday from your perfect (brother, sister)! A sis like you is hard to find. You are the best sister ever. You are the greatest gift in my life. Happy birthday, dear sis! I have shared so many things with you…my ups, my downs, my admiration, my jealously, my joy, my pain, but my love for you is still the greatest thing I share with you. I love you, sis! Let’s share your special day together! For your birthday, please accept a loving birthday wish from me: I love you and only want you to enjoy the best life has to offer. I only have the sweetest sister birthday wishes for my sweet sister! Happy birthday, sis! I thought of getting you a gift but I couldn't find one that would be good enough for you. There are no gifts or cards that could even come close to the love you have given me all my life. Hope all your birthday wishes and all the wishes we have for you come true. You deserve only good things. Happy birthday, sis! Happy birthday to a sister who is incredible, talented, kind, cool and gorgeous. It’s a good thing you take after me, your older sis, not our dorky brother! So what if you’re getting older. Like wine, you never get too old — you just start smelling and tasting like vinegar sooner or later. Actually, like fine wine, you become more and more intoxicating every year. Happy birthday! Happy birthday to the best of my best friends…a women that I’m so delighted to call my sister! Want to know why I think I'm so fortunate and grateful to have a sister like you? It’s because my life would just lose all color without you. Have a blast on your birthday! When I think back to our childhood, it becomes so clear why I consider you the "Sister of the Century." You've always been there for me. With all my heart, I wish you the happiest of birthdays! Good sisters are what you get when you have good karma. You get great sisters when God is smiling down at you. You’re simply great. Have a great birthday! You're yin, I’m yang. You love The Rolling Stones, I love The Beatles. You love hotels, I love camping. Because of our differences, I get so much more out of life. I'm glad you're my sis. Happy birthday! There's only one person with whom I can share my every joy, my every weakness, my every secret. It’s you, my sister. Here are my very best sister birthday wishes for the best sis! Happy birthday to a sister who knows what it takes to be a wonderful sister. May you only find happiness on your special day and beyond. On this special day, all the wonderful memories we've made together make me feel warm inside. You will always have a special place in my heart. Happy birthday, sis! A sister can be many things in one — a role model, a sidekick, a pain in the neck, a comfort, whatever — but you’re just one thing to me: wonderful. Happy birthday, my darling sister!